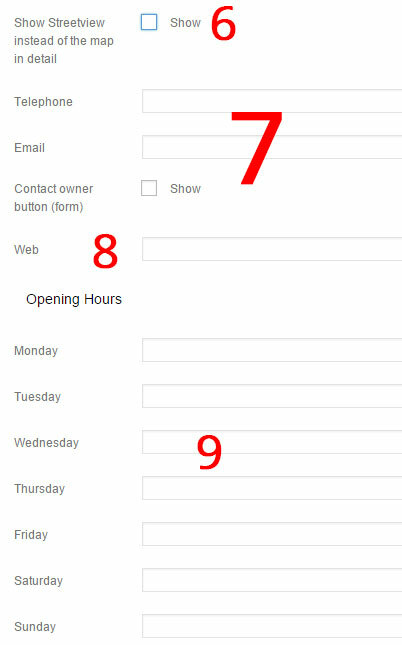 On the homepage, on the right hand side select REGISTER and choose a username and enter your email address (must be a valid email address as your password will be emailed to you). Now select a package (pay yearly or monthly) and click “Buy with Paypal”. As long as you have selected a username that nobody else has used, you will be redirected to Paypal whereby you can pay your subscription fee. Once paid, your account will be activated and your password will be sent to your email address. Check your emails. Now you will be able to log in. Once logged in, you feel free to change your password to something more memorable, or you can stick with the auto-generated one. 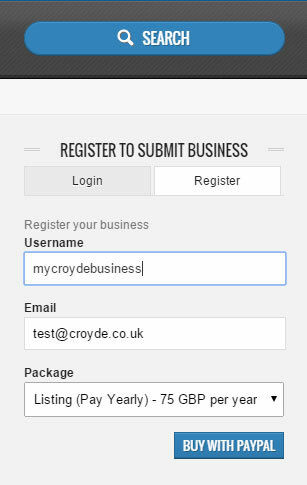 You will now see your account dashboard, which will allow you to not only add a listing to the Croyde Directory, but also to change your personal details, and various other things. Once logged in, to add your business to the directory, click the blue “ADD NEW ITEM” button and follow these instructions. Note: all items will need to be approved by us. If you get stuck with anything, such as adding a picture or map location, then just skip that section and we’ll do this for you before approving the listing. 2. In the box underneath, write a few paragraphs about your business. If you want to make certain text bold, then go ahead and use the simple tools just like in Microsoft Word. If you don’t know how to do this, then don’t bother. It’s really not important! 3. Now go to the “Image for Item” box and select “set featured image” and then “select files” from the pop up window. You can add one featured image per listing. We would recommend that the image you use is square or rectangular shaped, smallish in size, but good quality, and is perhaps a picture of your business place, or your company logo. If the image you use is very large, it will take longer for your page to load for others. Once you have selected your image, click the blue “set featured image” button. Now your image should show on your listing (you may need to wait for 10-20 seconds to appear if it’s a large image. 4. Now move down to the address field. Write your full address, including postcode, and click “find address on map”. So for example, the address could be: 12 Hobb’s Hill, Croyde, Braunton, EX33 1LZ. If your business location is found, it should show a marker on the map (feel free to zoom in!). If it is not found, then leave this out completely and we’ll help you after you have submitted your item. 6. If you want StreetView on your listing (highly recommended) then click show. Hopefully you will now have a streetview. If you do not, then you can manually drop the streetview marker on the map above (if you know what you are doing!). If you are not comfortable with this, then leave it to us. 7. Underneath streetview, add your telephone number and email address. 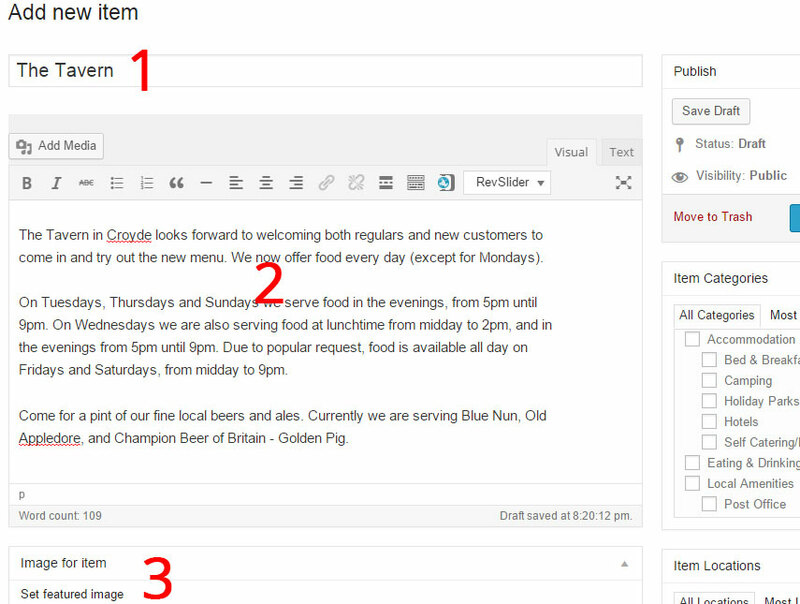 If you want people to be able to email you at the click of a button, then select “Contact Owner” button. 8. Add your website address. Ideally this should start with http://www. 9. Add your opening hours. List in any format you like, such as 9am to 5pm, or 9-5. 10. Now scroll right up to the top of the page. On the right hand side, select which category most suits your business. If your category is not listed, then leave this and we’ll create one for you. 12. You are now basically finished. Choose “Submit for Review” and we’ll take a look. To have a quick look at how your listing will look to others, then click “preview”. Note: this opens in a new tab. Close it when you have finished looking to return to the main screen. 13. IMPORTANT – Log out. You listing will now be submitted to us for review. We’ll contact you if anything is missing, and let you know when your listing has gone live. NOTE: There is a limit of one listing per account. If you decide you want to delete an item to create a new one, you should “trash” it. In addition, you should also go to the trashed item and remove it permanently. To increase the number of listings for your account (adding further businesses), then please contact us for assistance.